In commemoration of the Singapore Bicentennial, KFC has placed a real-life statue of its founding father, Colonel Sanders, by the Singapore River. The idea was born between KFC and its creative agency partner, Ogilvy, to pay homage to the Founding Colonel of the world’s favourite fried chicken brand, with a sense of humour. Building an exact replica of the original and new founding father statues, the KFC version had a classic twist – a real human posing as the statue. This allowed the brand to engage with onlookers and grab attention. And attention it got. 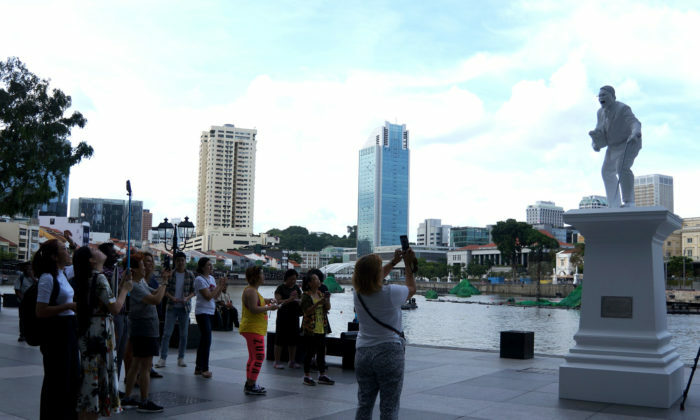 To commemorate this, for one day only, a Colonel Sanders statue played by an actual person posing, stood alongside Singapore’s founding fathers by the Singapore River much to the intrigue and surprise of Singaporeans. “We are a brand that loves to have a bit of fun and share our take on topics that our consumers love. We saw the celebration of Singapore’s founding fathers as an opportunity to celebrate our own founding father, with the signature KFC twist and playful spirit, ” said Juliana Lim, senior marketing director, KFC Singapore. This year marks the 200th year since Sir Stamford Raffles landed on Singapore and the nation has also recognised other prominent founding fathers with their statues erected along the Singapore River: Sang Nila Utama, Munshi Abdullah, Naraina Pillai, and Tan Tock Seng.